Retired Stagerigger; Retired Psychiatric & Chemical Dependency R.N. 2 Rescue Dawgs & 6 GrandBratz. 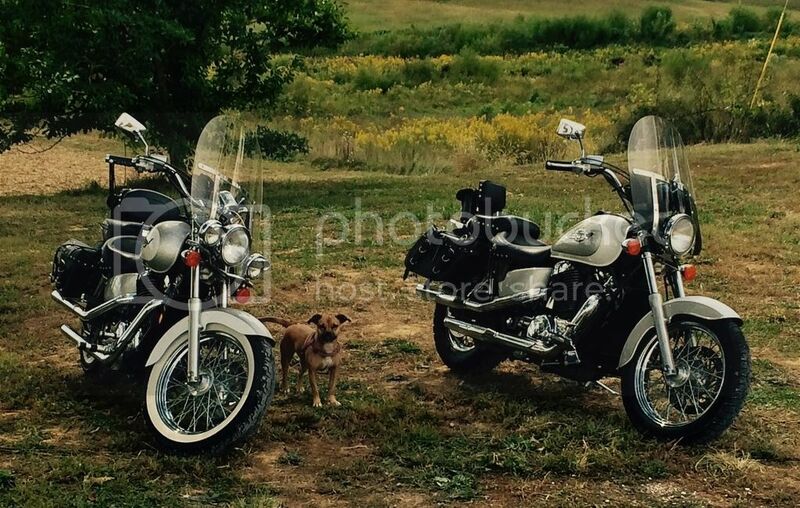 The VT1100C2 ACEs: the '97 Flyin' Jenni, rescue dog Hobo LongNose, and the '96 on the right. 02:36 PM - "Captain D" mentioned Gnarly in post What's the strangest thing to cross the road while on your bike? 09:52 AM - "Captain D" mentioned Gnarly in post What did you do to your bike today? 03:58 PM - Scared mentioned Gnarly in post Tire/Wheel Normal? 10:39 PM - Gnarly quoted BobS761 in post Insults, really? 10:44 PM - blue flames quoted Gnarly in post Starting the bike in gear. 09:03 PM - blue flames quoted Gnarly in post second post Yea !!! !